2500 years ago Buddha himself made some observations about the human mind operating as ‘monkey-mind’. He described the human mind as being so busy and overwhelmed; it was as if it had monkeys in it that continued to jump from branch to branch, chattering and screaming. If these tendencies were evident to Buddha all that time ago, it is no wonder that we struggle to calm our minds today amongst the constant over-stimulation of the modern world. ‘Monkey mind,’ is a Buddhist term describing unsettled; restless; capricious; whimsical; fanciful; inconstant; confused; indecisive; uncontrollable thoughts with possible side effects of anxiety, sleeplessness, worry, inefficiency and even anger all of which can be detrimental to our mental and physical health. So how can we learn to focus and control our thoughts – and how can meditation and mindfulness help? By closing off from the distractions around you, either by focusing on a guided meditation, your breath or a mantra, you become more aware of your breath, your thoughts and your body and how you feel in that moment. You learn to shut down the mental chatter and find peace by listening to yourself. Meditating first thing in the morning before the hustle and bustle of the day can help you get into a positive headspace while meditating in the evening can help to ensure you won’t take any of the stresses and worries of your day to bed with you. Through practice, you can train yourself to meditate for longer periods each time. While meditation focuses on the inner-self with the aim of quietening the mind, think of mindfulness as consciously being fully present in the moment; making an effort to be more aware of where you are, what you’re doing and what’s around you. It’s easy to rush through daily life without really being present in what we are doing. We act as if we are on autopilot desperately trying to tick things off a list and often multi-tasking as we go. How often do you find yourself answering an email while cooking dinner, or making a phone call while out walking the dog? As well as not enjoying the present for what it is, this state of distraction also means we’re not fully aware of ourselves either. We’re not registering how we are feeling or reacting to experiences as they happen. Most importantly our over-stressed minds are missing the basic signals our bodies give off when we are overtired, stressed or even hungry. 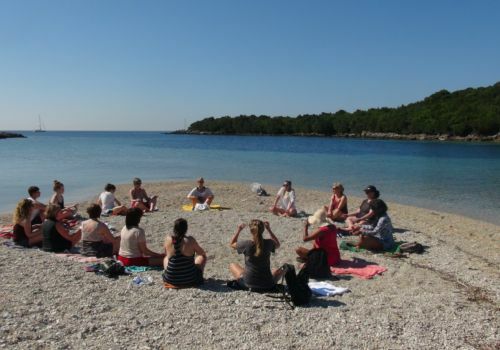 If you so choose to, you can develop and improve your meditation and mindfulness techniques while on holiday at either of our two lovely Greek island centres - aiming towards returning home with valuable new skills that will help you become more efficient and focused in all areas of your life. While meditation and mindfulness are skills that you can hone and develop on our holidays, it is by no means the main focus of the holiday, and whether you join in these classes is entirely up to you.